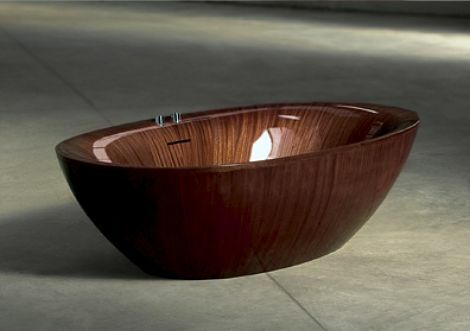 from the mixed up files of mrs. basil e. really-want-this-but-couldn’t-afford-it-in-a-million-years, i give you this gorgeous wooden bathtub collection from swiss yacht building company laguna. these designers are all about ergonomics and the finest craftsmanship. 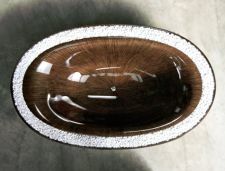 their wood veneer selection, which includes mahogany, wenge and walnut, is chosen from designated forests that have controlled felling and reforestation. layers upon layers of veneer are high pressure pressed together and covered with resin, then finished with a special varnish able to withstand extreme conditions. currently, there’s the freestanding pearl, the spa (which has an oversized edge filled with pebbles for integrated overflow) or the rectangular basic. laguna is pleased to outfit these models with jacuzzi jets, as well as install any of their styles on your yacht. see more images and get more info on their website. That one with the pebbles is so cool. Please, can we have one? oh i think we should get two, so we can put one on our yacht. 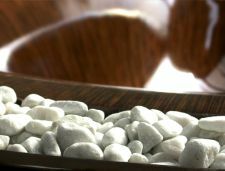 all i can think when i see the pebbles is; dear god, is it my turn to clean the pebbles in the bathroom AGAIN? oh… I looove that tub! 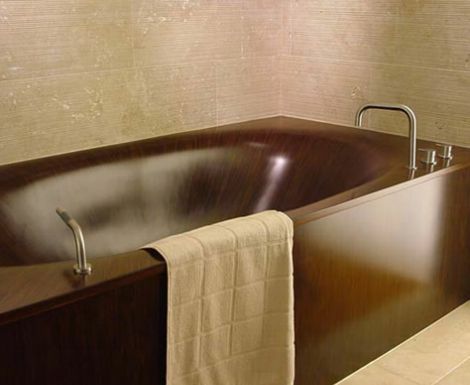 i love these tubs too… i cannot even imagine what it would be like to sink into one of these — utter bliss. Okay, my husband and I have decided that when we are richer than god, we will own the spa one with the pebbles for overflow. What luxury! hi, cool things on your site. i love wood! 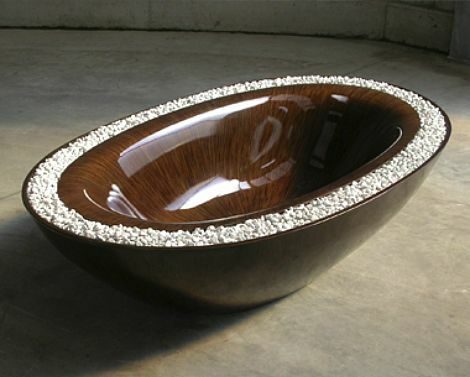 i’ve found an other bath tube http://www.arte-lignum.com/whirlbad-klein.jpg with whirl. What do you think about this? that’s a nice tub, much more linear that these pictured here. it looks like it is well made too. thanks for showing us the link! 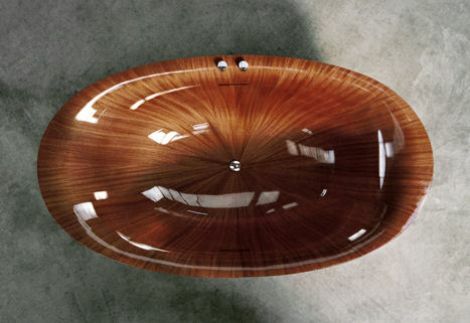 some of those organically styled sinks are very pretty bill. thanks for the comment! You can saw the veneers yourself. Resign would be about 200â‚¬ for that tub. I guess I will give it a try.